The wrapper adorning this Diadema is a darker brown and has a slight red hue to it. There is a network of smooth, fine veins running across the oily wrapper. The seams are smooth but easily visible due to vein placement. The pointed head is nicely finished. The band is long and has a nice color combination of cream, cardinal red and gold and displays the company and line name. The aroma from the wrapper is a mix of wood and stone fruit while the foot brings pretty much the same. The pre-light draw is a mix of leather and cherries. 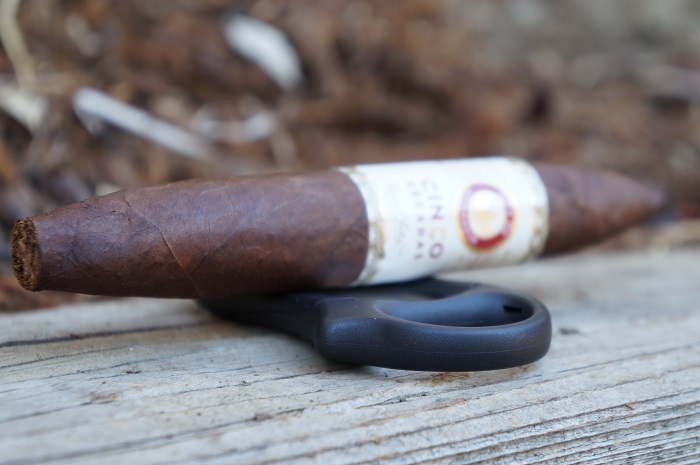 The perfecto is great in hand and the tapered head is quite distinct on the cigar. 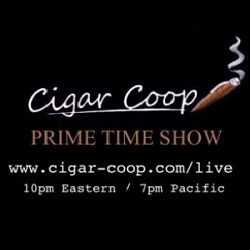 The cigar is firm throughout and it has a great dark coloring to it; what I would classify as maduro. The dark chocolate wrapper is showing some small to medium sized veins throughout and it has a fairly firm texture throughout, slight give here and there. The texture is slightly gritty with some oils here and there, and the aroma on the wrapper is of soft spices, rich earth and some fruitiness with that which has some fermentation qualities to it. The foot is showing some creamy, woody earth and fruity qualities as well, and it is quite enjoyable with a great cold draw. 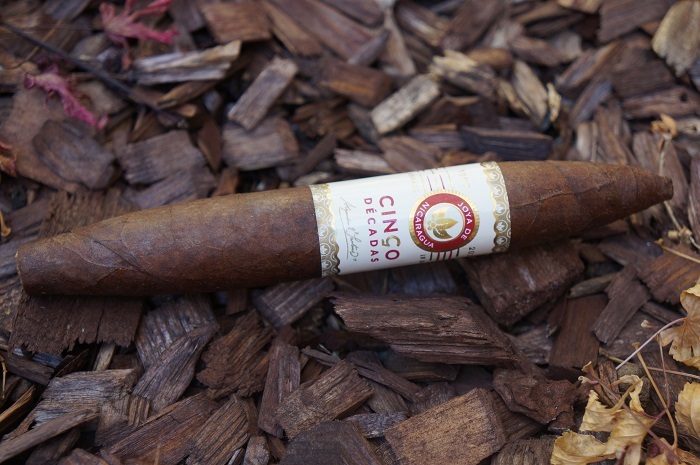 The Joya de Nicaragua Cinco Decadas Diadema has a large cream, gold, white and red colored band. 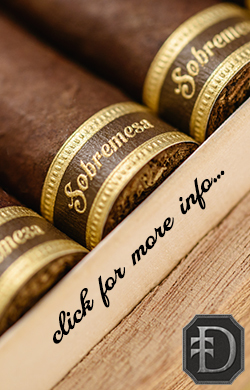 The cigar is a Diadema vitola with a chocolate brown color wrapper. The wrapper noses of leather, cedar, spices and old barnyard. In the foot, I’m also picking up hay. 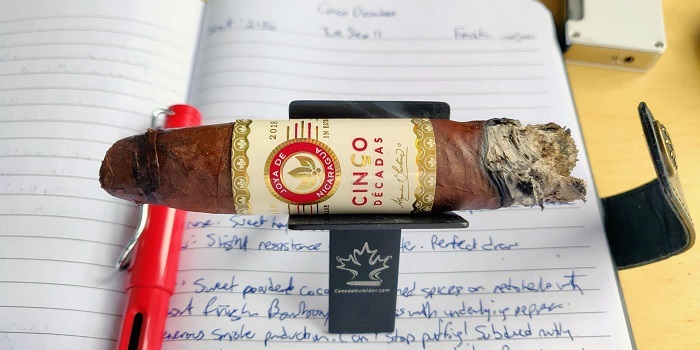 The Joya de Nicaragua Cinco Decadas Diadema has a rustic red hue to the Colorado Red wrapper shade. Construction looks and feels solid as veins are well pressed, seams visible but tight, bunch and roll even and a well applied thick cap. Aromas from the wrapper give aged cedar, mixed nuts and a hint of white pepper. Aromas from the foot tell bigger notes from that of the wrapper. Cold draw tells cedar, plums and dried persimmons. 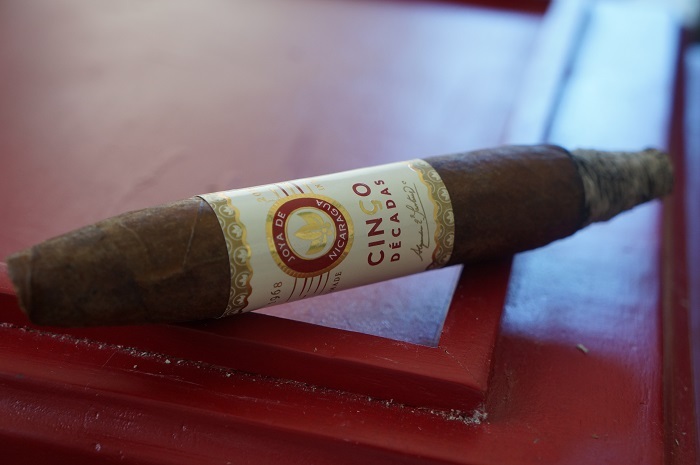 The cigar starts out with some creamy wood along with some baking spice not far behind. At a quarter inch in, the baking spice becomes a bit fuller. 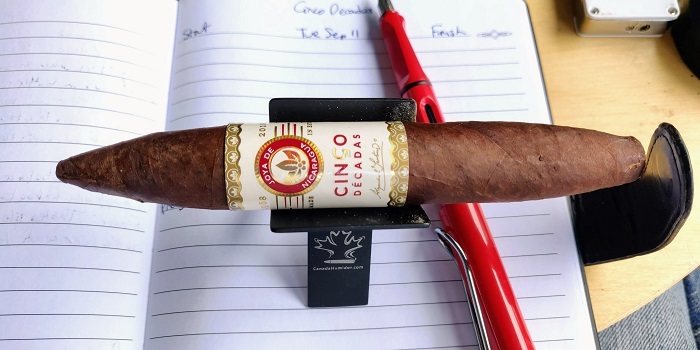 At the three quarter inch mark the cigar begins to open up as the baking spice becomes even with the creamy wood and some cherry sweetness becomes present in the background. At an inch in, on random draws a get this nice creamed cherry flavor. The retrohale consists of some toasted wood and the creamed cherries. The strength in this third was slightly below medium. The first third opens up by showing a great bit of spice and it is presenting some sweet characteristics with some pepper as well. There is a fruitiness present and it is showing some wine like qualities. On top of that is some wood characteristics and it has some leathery and meaty qualities as well. 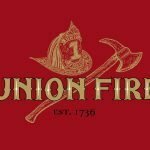 I would classify the cigar as being medium-full in terms of strength and body and the same goes for the flavors being delivered. The first few puffs deliver sweet, powdered cocoa. The retrohale has medium strength spices, that have a short finish. As the cigar progresses, I’m getting a distinct bourbon sweetness with underlying pepper. Only a few minutes in and the smoke production is quite pronounced. Once the first third has settled in, some subdued nutty flavors come in under the spices, and mild leather has joined in on the retrohale. On the post draw, some tannic cedar adds to the complexity. The bourbon sweetness continues to evolve, adding a creaminess by the midway point. The first third’s flavor profile consists of a pretty well balanced one with a subtle dry red pepper spice, loads of creamy bread and sweet potato like consistency and sweetness. Retrohaling brings plums, cedar and more intensified dry red pepper spice. The finish is fairly clean with slight charred wood and dry earth. Strength and body is medium. As the second third begins, the cherry note has gone away while the baking spice has receded quite a bit. The wood and cream are up front creating a very silky smoke texture. At a quarter inch in, some of that cherry sweetness returns. The retrohale is presenting some toasted wood and cream. At an inch in, not much has changed. Still the creamy and toasted wood with hints of cherry sweetness. At an inch and a half, the cream recedes a bit letting the toasted wood take the front stage. The strength in this third bumped up to medium. 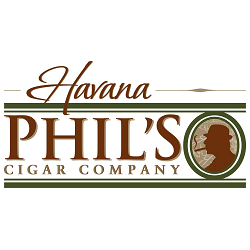 I am in the second third of the cigar now and finding that it is continuing to deliver that spice profile and with that is some fruitiness. There are some red currant like flavors present and with that is the wine quality from before. The spice is sweet and peppery, and it is a combination of black pepper and nutmeg. The finish is that of wood and leather and like the first third, it is smoking at a medium-full level in terms of strength, body and flavors. 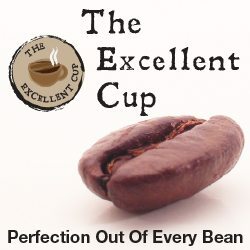 The flavor profile is consistent and doesn’t have any remarkable flavor changes during the transition. 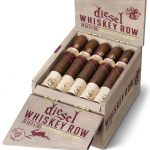 I would describe the flavor profile as sweet, creamy, cocoa with a bourbon woody finish. The tannic nature of the cedar has abated. As the middle third settles in, the cocoa increases in intensity to medium, almost medium plus. The flavor profile expands within the second third. Rounding out the subtle dry red pepper, creamy bread and sweet potato texture and sweetness are baking spices. The baking spices at times also creates an effervescence to the profile. Retrohaling now brings spices in the form of both cedar and the dry red pepper. The finish lengthens a bit with the same slightly charred wood and dry earth. Strength and body remains medium. As the final third begins, the cherry sweetness has dropped out as some mustiness has joined in to pair with the creamy wood. At a half inch in, the cream has further receded while the mustiness is up front with the wood. The retrohale is a musty and creamy wood. 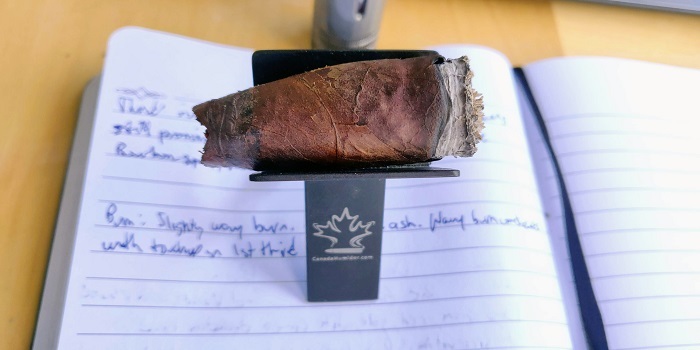 As the cigar comes to a close and is reducing at the taper, some char joins in with the musty wood as the cream has completely left the profile. The strength in this third bumped up to slightly above medium. 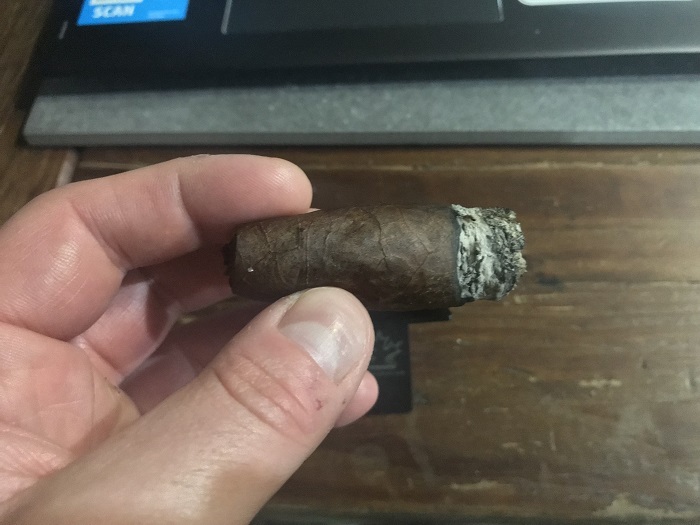 When I get into the final third of the cigar, I find more transitioning in the flavor profile and it is showing more of a woody and spicy finish. The fruity and wine like qualities have faded and it is more focused on notes of cinnamon, pepper, nutmeg and baking spices. 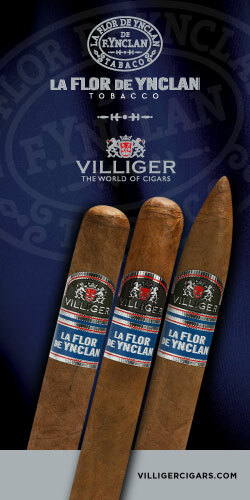 There are woody qualities present with that, oaky characteristics and the finish is that of tobacco and leather. I would classify the final third as smoking at a medium level, maybe between medium and medium-full, and that goes for strength, body and flavors. The sweet cedar intensifies moving into the final third. The bourbon character is still prominent, as a toasted peat smoke comes through on the retrohale. As the final third settles in, the bourbon sweetness carries through into the post draw with a medium length finish. At the halfway point of the final third, the cedar takes on a toasted quality. The last third although still good, throws off the balance a bit by having too much of a baking soda and cedar delivery. The retrohale also accentuates the greater intensities in spices. Strength and body finishes medium. The burn line was pretty wavy and did go out once in the first third requiring a re-light. After the relight, around three quarters of an inch in, the ash held on for about three and a half inches before it dropped. This perfecto smokes great from start to finish. 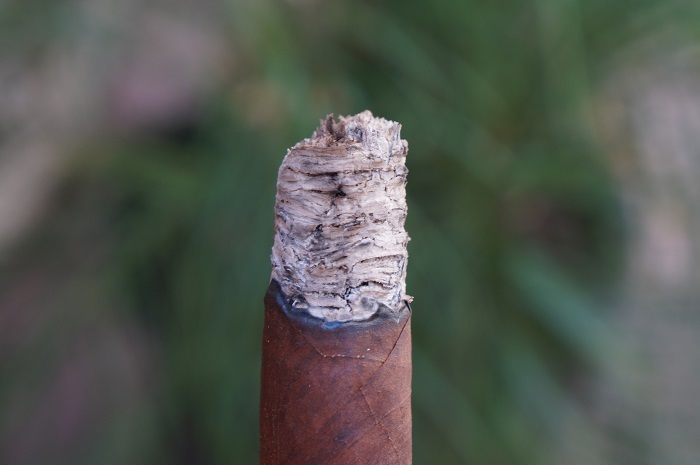 I love how the ash held on perfectly with each tapered end and it is a great look on a cigar when that happens. 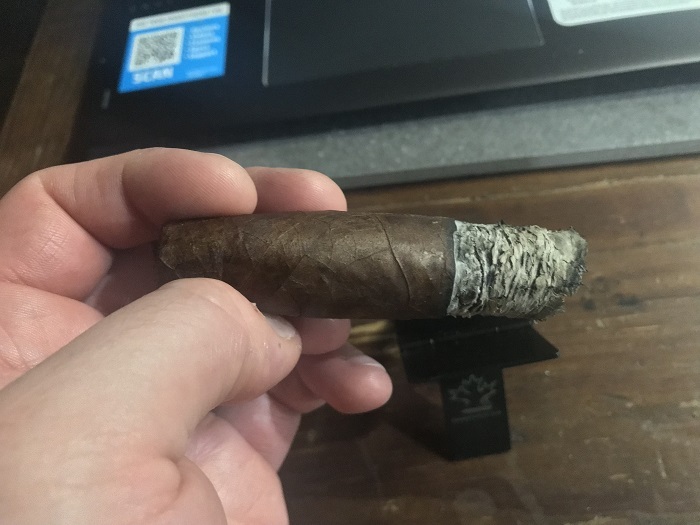 The ash had a nice light gray coloring to it and could not ask for more in a cigar. 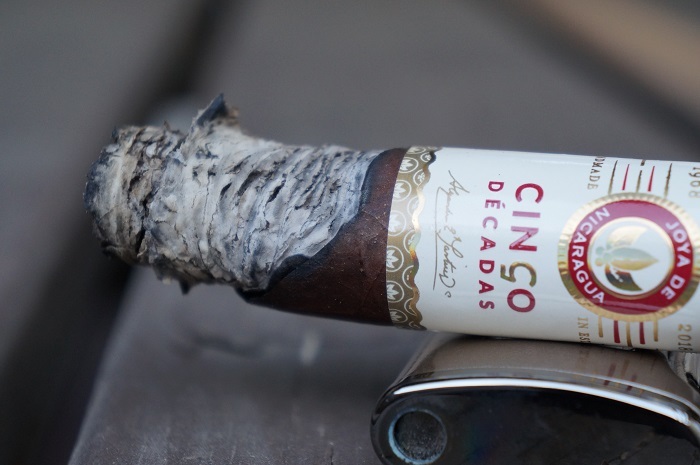 The Cinco Decadas has a slightly wavy burn that requires a touch-up in the first third. The ash is a gray-white color, and the ash holds on well in 1.5+ inch increments. The burn performance overall was very good. Only a touch-up needed. Other than that, very solid ashes averaging 2 inch increments, overall cool burn and relatively even burn. The draw was a bit tight at the beginning, but once it reached the full ring gauge it opened up to the level I enjoy and remained that way throughout. 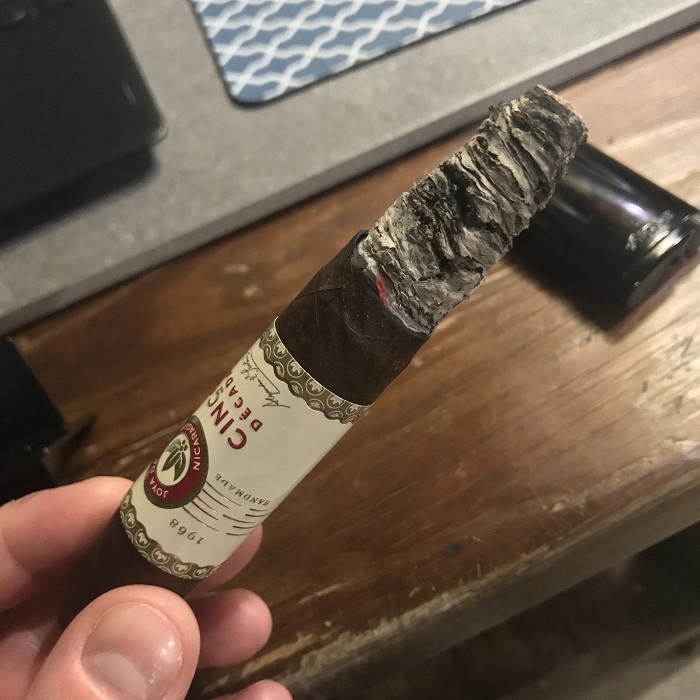 Once the cigar got past the initial taper, it really opened up with creamy wood, baking spice and some cherry sweetness and held that until it started to reduce in ring gauge when some char joined in and the cream fell off. The burn was fairly wavy and I was able to let it self correct and the draw was very good. 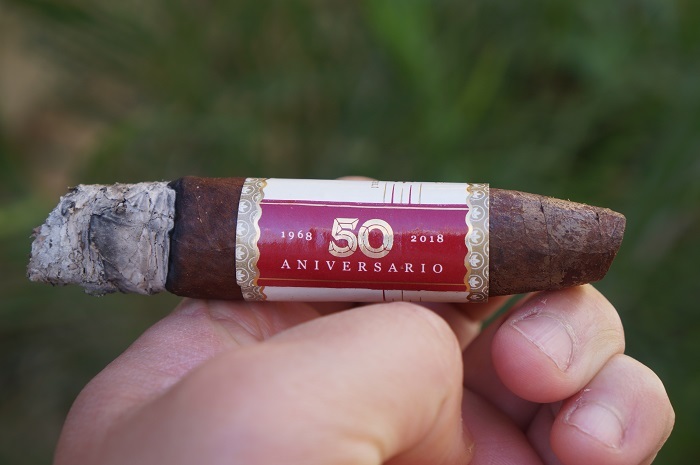 This is a great way for Joya de Nicaragua to celebrate their 50th anniversary as the cigar is a great experience. 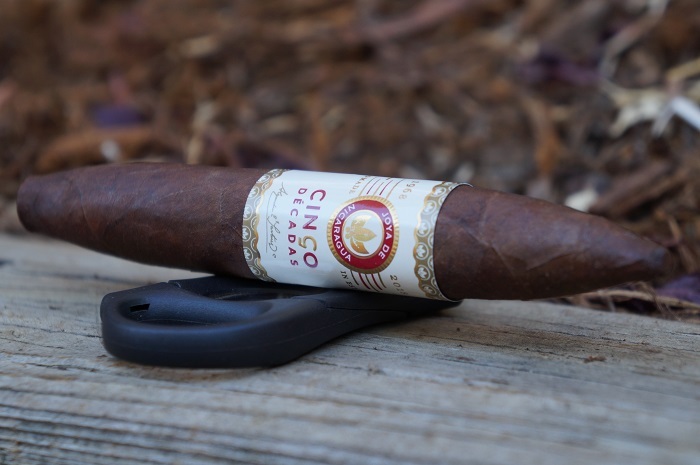 I’m very interested in trying the El General vitola to see the different experience it provides, but this cigar is definitely worth seeking out and I am looking forward to smoking more. Draw was perfect from start to finish. 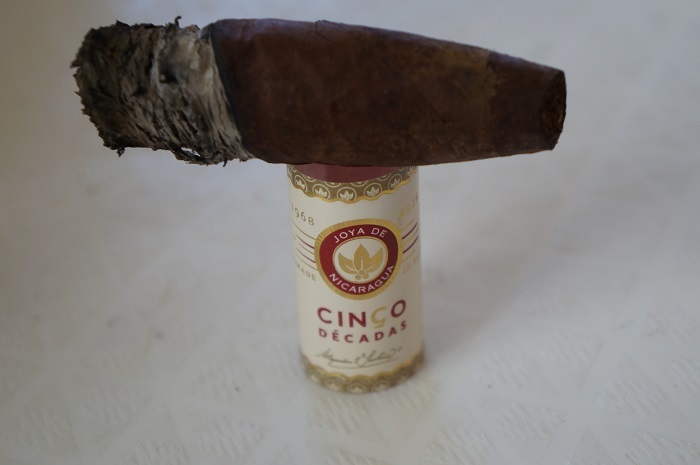 Even with the tapered head the draw was cool and no matter the ring gauge of the cigar at a particular time there was just the right give on the draw. Just amazing all around. I am a big fan of this new offering from Joya and I think the sizes they chose are fantastic. 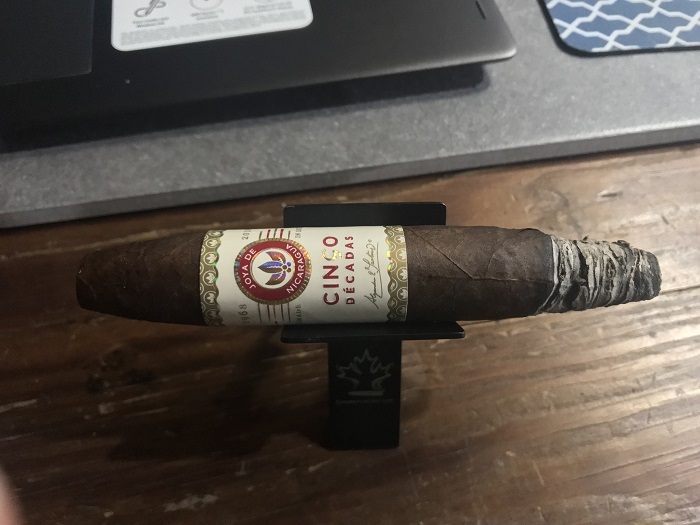 While I prefer the El General offering, it is great to see how the cigar smokes in this perfecto vitola and I think it produces a more complicated and educational smoking experience. The construction was perfect from start to finish and with that it produced a nice medium to medium-full smoking experience. I enjoyed the flavor profile, it was complex but not too much for a lot of smokers on the market. 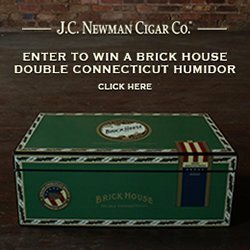 I think this is a cigar that can be approached by many consumers. 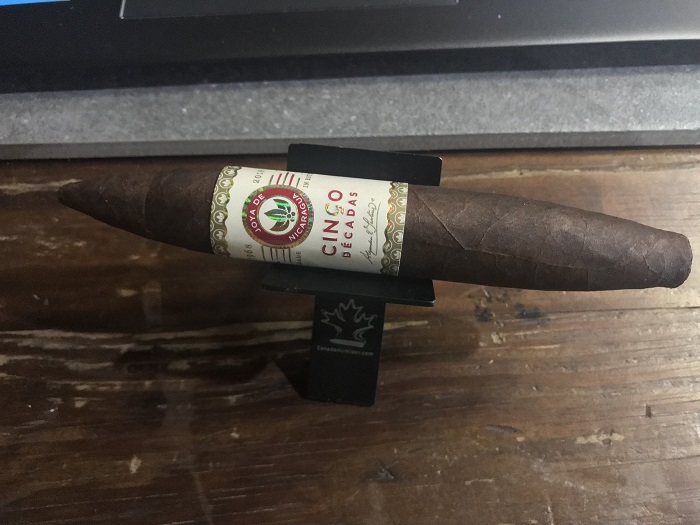 I wouldn’t go for this size down the road if I had to chose between this and the El General, that is a personal opinion, but I think this offering gives the smoker a better opportunity to see how each tobacco plays a part in the cigar. 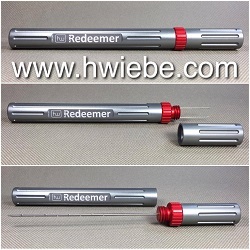 Using a v-cutter, the draw is perfect, with just the right amount of resistance. 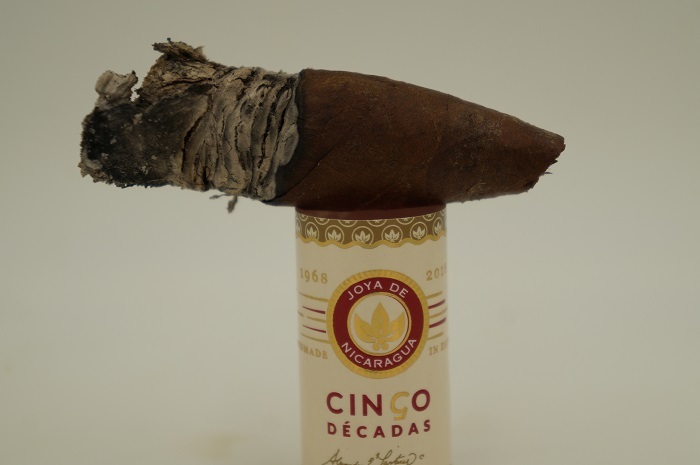 The Joya de Nicaragua Cinco Decadas Diadema is a crowning achievement release from Joya de Nicaragua. Previously, the Cuatro Cinco was my favorite release they had produced. 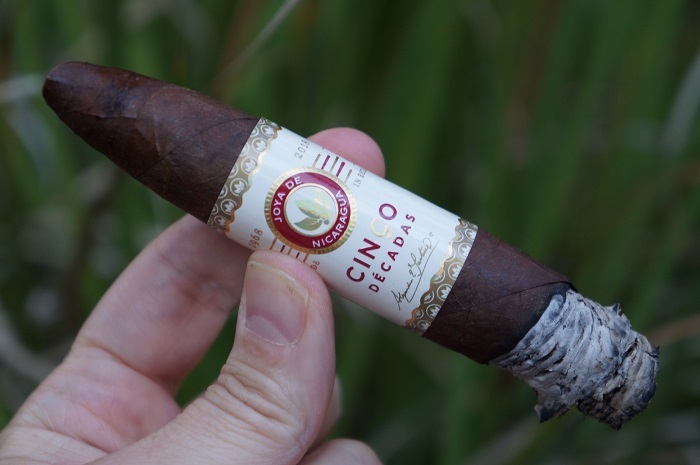 This cigar ticks every flavor box I enjoy, and is fantastically balanced. I look forward to comparing the Diadema to the El General. 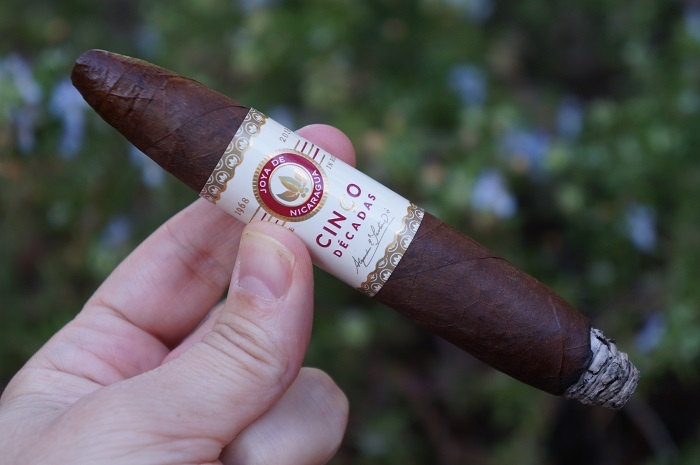 While smoking this cigar, I kept thinking this is the embodiment of simplicity in great flavors. 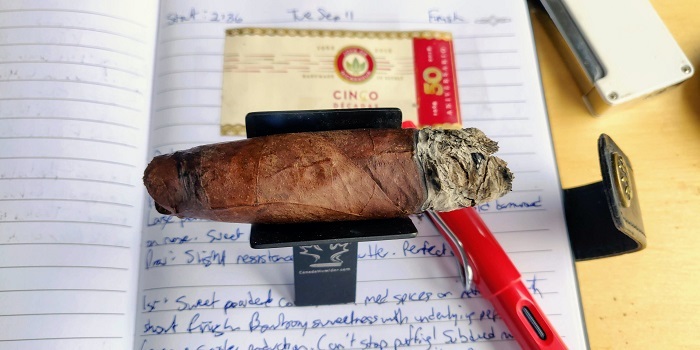 This isn’t to say the cigar was not complex or nuanced (because it was). But the delivery of flavors worked very well with just the right notes of sweet, spice, earth and at times umami. 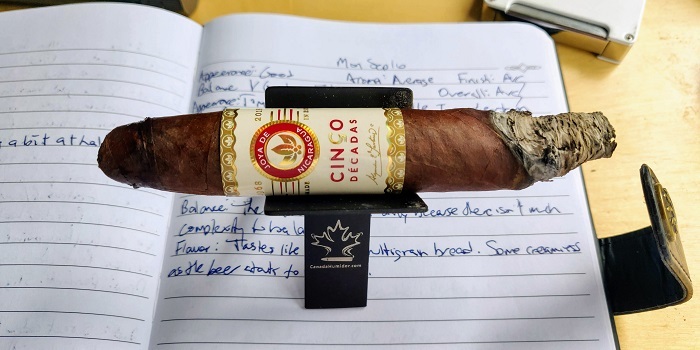 This is well worth the $20 or so MSRP and fitting to be the Cinco Decadas.